You are here: Home / Great Deals / Amazon Deals / 10 Movies Under $10! 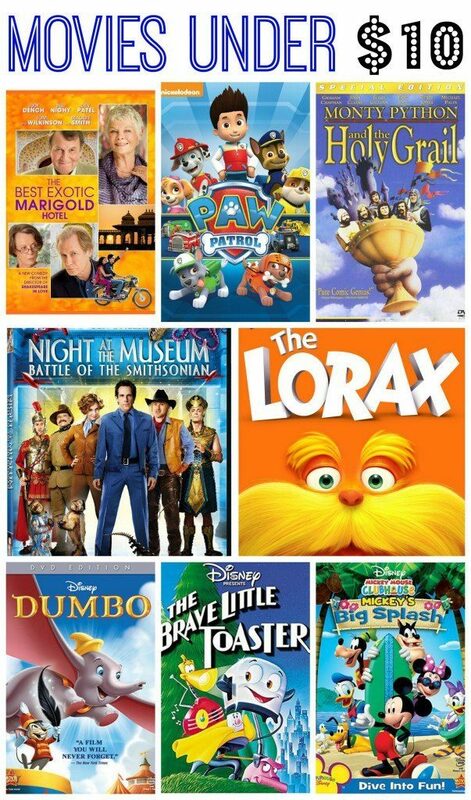 Looking for some new movies for your home movie collection? We have you covered! Check out our list of 10 Movies Under $10! Night at the Museum: Battle of the Smithsonian , $4 + FREE shipping with Amazon Prime or Super Saver Shipping! Willy Wonka & the Chocolate Factory , $4.25 + FREE shipping with Amazon Prime or Super Saver Shipping! Monty Python and the Holy Grail , $4.75 + FREE shipping with Amazon Prime or Super Saver Shipping! Matilda , $4.75 + FREE shipping with Amazon Prime or Super Saver Shipping! The Best Exotic Marigold Hotel , $4.99 + FREE shipping with Amazon Prime or Super Saver Shipping! The Brave Little Toaster , $4.99 + FREE shipping with Amazon Prime or Super Saver Shipping! Dr. Seuss’ The Lorax , $6.49 + FREE shipping with Amazon Prime or Super Saver Shipping! Dumbo , $7.50 + FREE shipping with Amazon Prime or Super Saver Shipping! Mickey Mouse Clubhouse: Mickey’s Big Splash , $7.50 + FREE shipping with Amazon Prime or Super Saver Shipping!! Paw Patrol , $8.12 + FREE shipping with Amazon Prime or Super Saver Shipping!